Now I have another problem. i want to send this camera to my other granddaughter, but, I can't get it to go into P mode. When I press the button on the of the selector to change modes and select P, the screen shows AV mode. I've always used it in either M or TAV, but though I can get to go in M mode, I now can't get it to even go in TAV mode. I've done two resets, nothing changed. The battery is now out of it since about 10am this morning. I'm hoping this will fix it. But what happens if my granddaughter gets the camera and it happens to her at some point in time, is she going to know how to change it so it will work right for her too? If you turn the selector knob, to each position, what do you see? Location: Cruising PentaxForums and watching your back. I see, M, X,. B, Movie User 1, AV, and on the screen. But no green, no P, no Sv, no Tv, and no TAV. Last edited by photolady95; 02-12-2019 at 09:06 PM. So, when you turn the knob to those positions, what does it display? And, when you turn it to the other positions, does it show the correct one on the screen, for the knob position? If it does not, then it would be knob failure, i.e. mechanical, where, if it's simply not displaying some modes, you may want to test it with another lens and see if it does the same. Are you testing it with a lens attached? When I turn the knob, this is what I see on screen, M, X, Bulb, Movie, and AV. Then after AV, turning the knob, is showing as AV too. I see no other setting. But this is with no lens attached. I'll try later tonight with a lens attached. Well, dang. All that worry for nothing, put a lens on, and everything is fine. Put the 18-55mm on and turned the mode switch to TAV, TAV shows up on the LCD screen just like it's supposed to. Thanks Mark for booting my brain and suggesting a lens be used for testing. I'm glad that fixed it for you. I had a strong suspicion that was the issue, but I was worried it could have been mode dial failure. Although rare, it's not unheard of. All I can say is phew! I'm glad it wasn't mode dial failure and I've read about that happening to the K-5 on this forum and was praying it wasn't that. When I send the camera out to her, I'll explain to her never turn the camera on without a lens attached. Well, sometimes, you want it on without the lens attached, such as when using the mirror up function to blow dust bunnies off the sensor. The K-5 is a bit of a dust magnet. I haven't found that to be a problem with either of mine. But when I change lens, I tilt the camera down, or I have it inside the backpack or inside the back of my Jeep. I never change lenses in the open air. I do the same with all my cameras. Plus on the K-30 and K-50 I have dust remove on start up and shut down. On the K-5 I have it set for start up. Same as you, but with the K-5 I had to blow out the mirror box every now and then. With the K-1, so far, it's not been necessary. I do like the dust finding feature in the K-5. No idea why they got rid of that in later models. I found that very useful. do like the dust finding feature in the K-5. What dust finding feature is that? 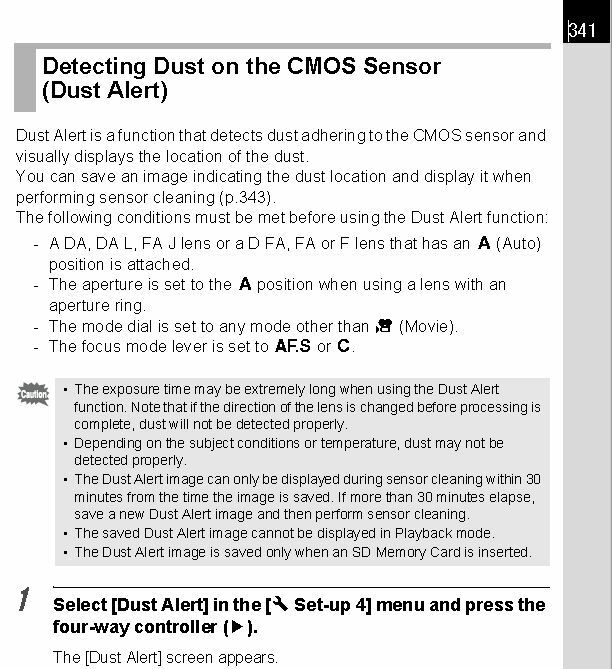 Dust Alert in the same part of the menu system as Dust Removal. See page 341 of the User Manual. Who reads the manual? LOL Ok, I'll check it out. Thanks Mark! Just looked and startup is set, but Dust Alert is grayed out. Is that what you meant? That's why it wasn't showing up. I had it set on MF not AF.S and once I changed that dust alert showed up. All times are GMT -7. The time now is 11:47 PM. | See also: NikonForums.com, CanonForums.com part of our network of photo forums!